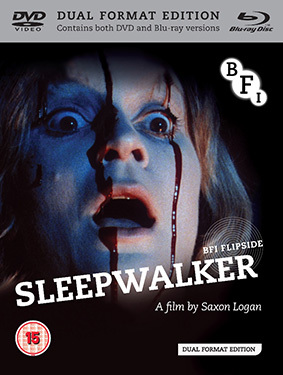 The 27th title in the BFI’s pioneering Flipside series, which is generously supported by celebrated film director Nicolas Winding Refn, is Saxon Logan’s long-unseen incendiary horror satire Sleepwalker (1984). When wealthy couple Richard and Angela visit Marion and Alex in their decaying family home, an evening of drunkenness and sexual rivalry turns bloody as the guests fall victim to an unhinged attacker. Featuring a rare acting performance from acclaimed director Bill Douglas (My Childhood, Comrades), and starring Joanna David and Heather Page (both of whom would go on to work with Douglas in his final film, Comrades), this outrageous mix of biting satire and bloody horror recalls the work of otherwise unlikely bedfellows, Lindsay Anderson and Dario Argento. The stellar cast also includes Nickolas Grace (An Ideal Husband, Two Deaths), and features cameos by Fulton Mackay (Porridge), Michael Medwin (Shoestring, The Army Game) and Raymond Huntley (Upstairs, Downstairs). The film has been remastered from the only surviving print and is being presented for the first time on any home video format. This Dual Format Edition (Blu-ray and DVD) also contains two short films by Saxon Logan and the rare 1971 mid-length fantasy, The Insomniac, directed by Rodney Giesler. Sleepwalker will be released as a dual format edition (including DVD and Blu-ray versions) on 23rd September 2013 by the BFI as part of their Flipside strand at the RRP of £19.99.